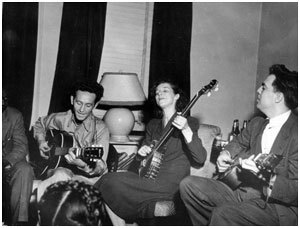 Left to right, Sonny Terry (obscured), Woody Guthrie, Lilly Mae Ledford and Alan Lomax in New York, 1944. Photo online with The Library of Congress, Alan Lomax Collection. That is the power of a good folk singer: someone who can speak and sing in a focused enough way to reflect the localized realities of the times, and with enough abstraction to speak to the ages. In this regard, Guthrie was a genius creator and producer of folklore, certainly a reflection of the folk of his times. Note: Woody’s acoustic guitar and folk songs killed fascists, too.